ShowArtists invites all artists / photographers, 18 years of age or older to enter digital images of photography for a juried online competition. Judged on artistic creativity and photographic quality. 5 categories: Mixed media, landscape, figurative, architectural and open theme. Jurors: Ann Shogren, Jude Steele and AJ Landon. PRIZE DETAILS: Each of the 5 Gold Award winners receives an international PR package worth $6000, that includes: a world-wide, international press release, a magazine article in our ShowArt Magazine, a live link from ShowArtists.com winners page to your own website and an announcement in our emailed newsletter to 18,000+ artists, agents and collectors. ELIGIBILITY: International / 18+ Not eligible to enter? - Find contest where you are. COPYRIGHT: Artists retain all copyrights to their art /photography images. 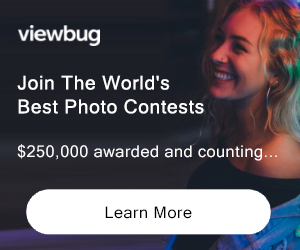 USAGE RIGHTS: By entering a competition, an artist /photographer is granting ShowArtists permission to show the image on the website in the entrant's portfolio. ShowArtists may use an entrant's image to showcase the winner and/or the competition and/or website online and by email to other competitors and collectors. Any use of the image on the website or for promotion of the photographer/ artist and/or winner is credited. ShowArtists does NOT sell the images to any other party for any other use.